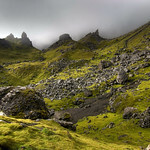 The visitor guide to Trotternish in Inner Hebrides has information on and around the place. 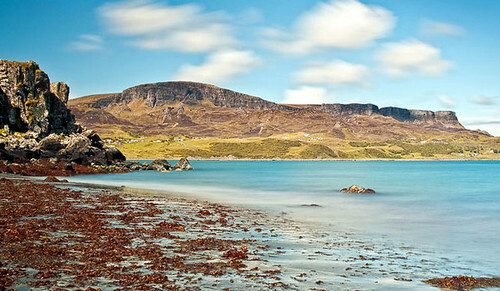 Also include information on Uig, sleeping and eating, and getting there, information on getting from Uig to Duntulm, Duntulum to Portree and the hotels and accommodation in these places. 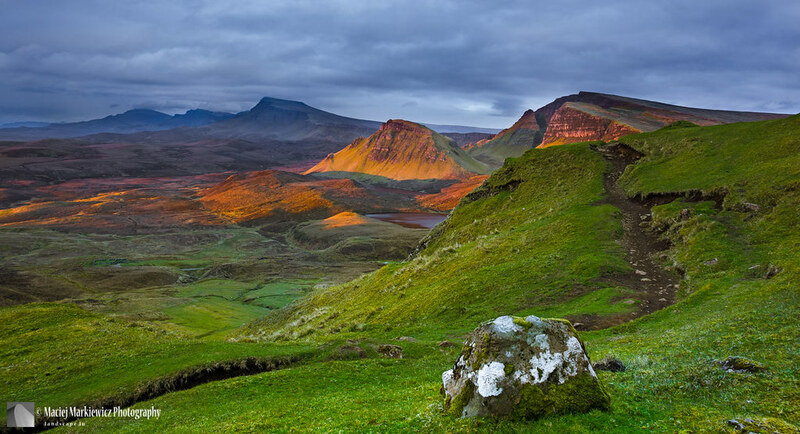 North from Portree is the 30-mile long Trotternish Peninsula, sticking out like a giant thumb. The interior of the peninsula is a basaltic lava wilderness full of bizarre rock formations. A 20-mile long escarpment of sheer cliffs and towering pinnacles dominates the landscape. 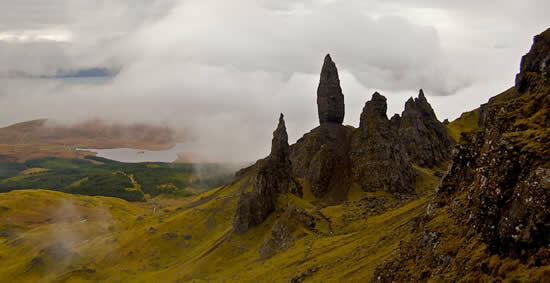 The best known of these strange formations, the Quiraing and Old Man of Storr, can be explored on foot. The A855 and A87 roads follow the coast around the peninsula, and a spectacular minor road bisects the ridge from Staffin Bay to Uig. Trotternish is best explored with your own transport, but there a few daily buses covering the circular route from Portree. 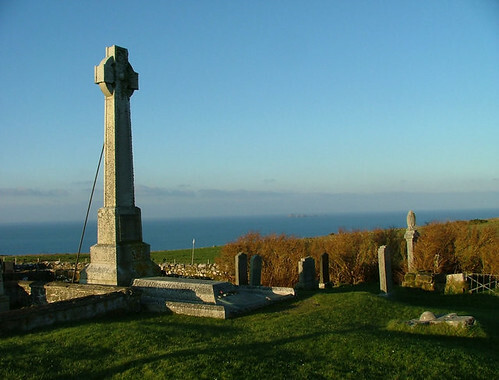 Behind the museum, at the end of the road, is Flora MacDonald's Monument, which marks the grave of Skye's most famous daughter, with her husband buried alongside. The rather austere memorial is inscribed with Dr Johnson's poignant tribute. At the northwest tip of the peninsula, 15 minutes' drive from Uig, is Duntulm Castle, a fairy-tale ruin dramatically perched on a steep cliff. 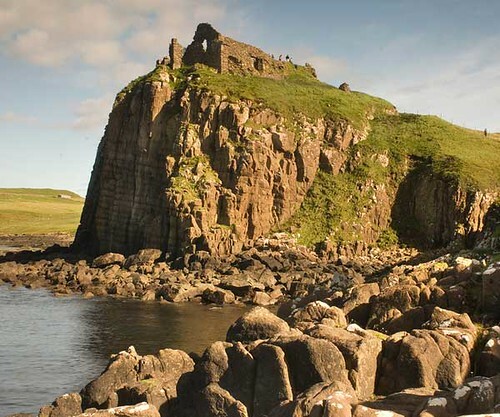 This 15th-century structure, built on the site of an ancient Norse stronghold, became the chief Skye residence of the powerful MacDonalds and was the most imposing castle in the Hebrides. According to local legend, the castle was abandoned around 1732 when a nursemaid accidentally let the baby heir fall from a window on to the cliffs below. Beyond Duntulm the A855 heads across the tip of the peninsula to the east coast, where the famous bizarre rock scenery is found. At the north end of Staffin Bay, a minor road cuts across the peninsula to Uig. 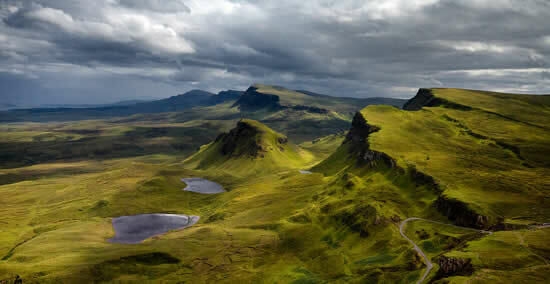 This road is the access point for the Quiraing, the famous jumble of strangely shaped hills and rocks that is one of the island's classic walks. 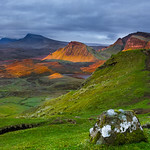 Even if you don't attempt the walk, the road over the back of the Trotternish ridge from Uig makes a worthwhile detour. 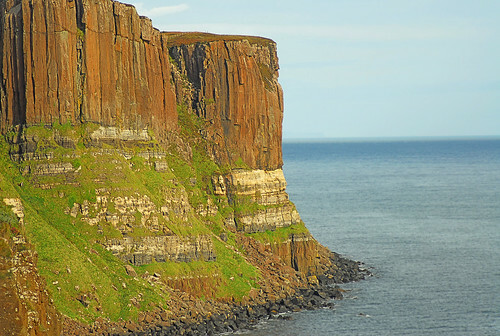 A few miles south of Staffin Bay is Kilt Rock, an impressive sea cliff which gets its name from the vertical columnar basalt strata overlying horizontal ones beneath. A rather tenuous comparison perhaps, but the cliffs south of Staffin are particularly spectacular, as are the Lealt Falls, a torrent of mountain water at the head of a gorge, a few miles south of Kilt Rock. The falls are signposted by the road, so all you have to do is park the car and peer over. Just before the turn for Kilt Rock is a wee museum sporting such finds as a dinosaur bone and bronze age artefacts (open May-October). 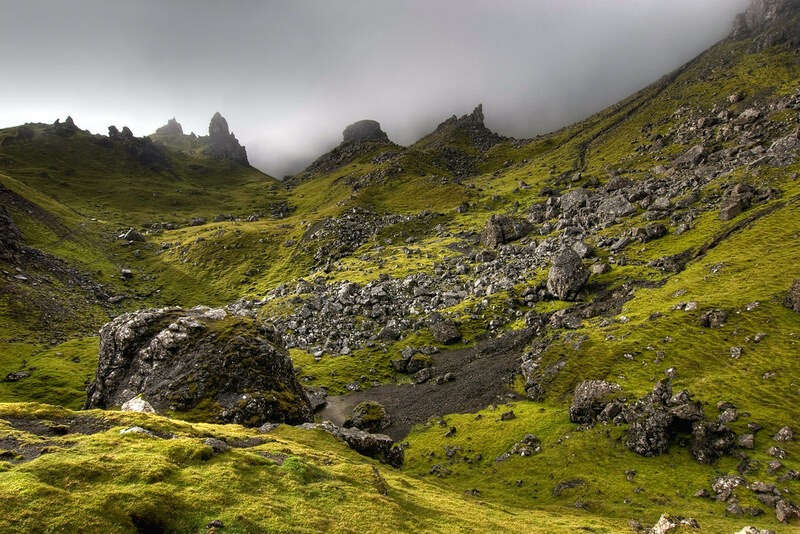 A few miles further south, and 7 miles north of Portree, is a car park which is the starting point for another of Skye's famous walks: up to the Old Man of Storr, the distinctive pinnacle of rock which has detached itself from the cliffs of the Storr behind. For a description of the route. The Pub on the Pier (open till 2300) serves cheap bar meals, and the famous Cuillin ales are brewed at the nearby Skye Brewery (tours by appointment, Tel. 542477). You can also change foreign currency here. The Ferry Inn serves bar meals and you can also eat at the Uig Hotel and the café by the filling station. A good place for food is the Oystercatcher Restaurant in the village of Staffin, Tel. 562384, closed Sunday. 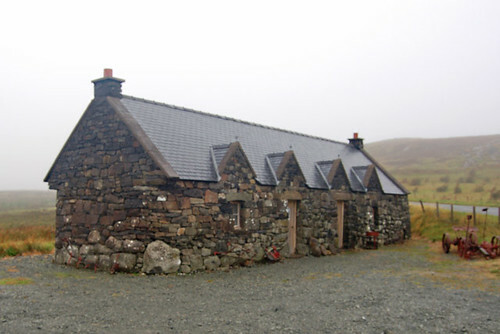 At Culnacnoc, just north of the Lealt Falls, is Glenview Inn and Restaurant, Tel. 562248, Fax. 562211. 5 rooms. Cosy and relaxed accommodation with a very fine restaurant. In Staffin is Columba 1400, an internet café with cheap food and great views. Open daily in summer, Tue-Sat in winter. Scottish Citylink runs a service to/from Inverness, Fort William and Glasgow. The Tourist Information Centre is inside the CalMac office at the ferry pier, Tel. 542404, and will book accommodation anywhere on the island; open 1 Apr-31 Oct, Mon-Sat, also Sun Jul-Sep.
Near the castle is Duntulm Castle Hotel, Tel. 552213, Fax. 552292, [www.duntulmcastle.co.uk] Open Mar-Nov. Friendly and homely with great views across the Minch to the Outer Hebrides. Idyllic and good value. Restaurant is open to non-residents. A few miles north of Staffin and 20 miles north of Portree, is Flodigarry Country House Hotel, Tel. 01470-552203, Fax. 552301. Beautifully located at the foot of the mighty Quiraing and with stunning views across Staffin Bay, this is one of the great country house hotels, with a relaxing old-world atmosphere and excellent restaurant. 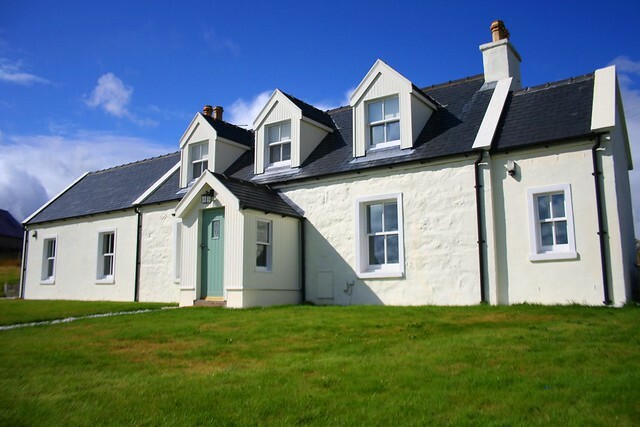 Flora MacDonald's actual cottage is in the grounds and has been tastefully refurbished, giving the chance to stay in a place steeped in the island's history. The lively bar is a good place to enjoy a laugh and a jig. Those that can't afford such luxury can always opt for the more modest , Dun Flodigarry Backpackers Hostel Tel./Fax. 552212. 66 beds. Open Mar-Oct. Laundry facilities, breakfast available and only 100 yds from the bar of the Flodigarry Country House Hotel. There's a campsite south of Staffin Bay, Tel. 562213, open mid Apr-end Sep.